I got home from the store and headed straight into garden clothes and out the back door. 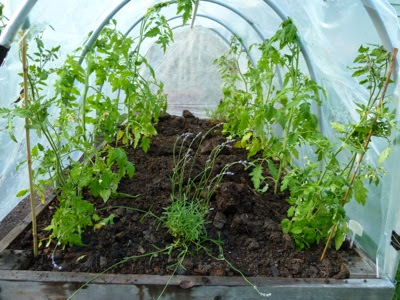 I planted my tomatoes in the hoop house bed. Got them in and tied to the frame. The wind really felt cool. 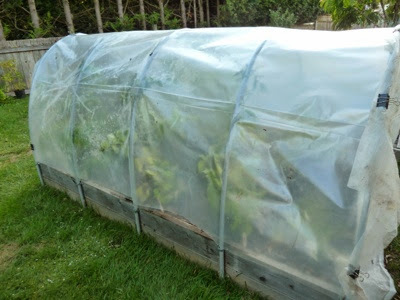 So, even though I had yet to have anything for dinner and well after 7, I decided I should dig out the plastic and throw it over the hoop house to keep them a bit warmer. That left the ends open. Oh crap, that north wind is cold. Ran to find the frost cloth/remay to cover the north end. And the clips, where are the clips?!! so.. I made three trips to the shed, locking it each time as I was pretty sure I didn't need anything else....uh, yeah, right. Look where lavender number six ended up. You can NEVER have too many bees. While I was at it, I decided to throw some frost cloth on the pumpkins and Butternuts. Crude, but it'll do the trick. 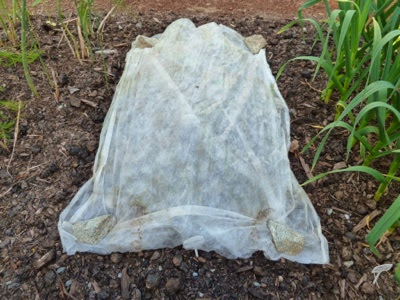 I'm surprised that you still need that protection on your plants in June. 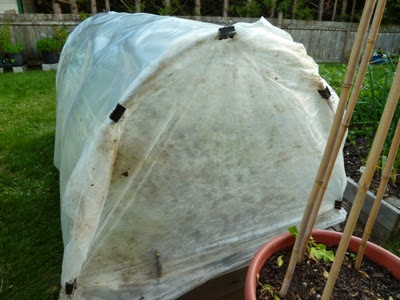 Having said that, our night-time temperature went down to 5C on Thursday night. You did good. I put out one tomato plant today..got the remay over it for tonight. It's still about your same degrees. Late tomatoes this year Erin... love your dedication BTW. I can be pretty tenacious!! I hope my plants at home are fine. Visiting Saskatoon and frost warnings last couple of nights. BRR! It has been chilly with the winds! I hope so too. If you lived here, I'd run over and check for you! !